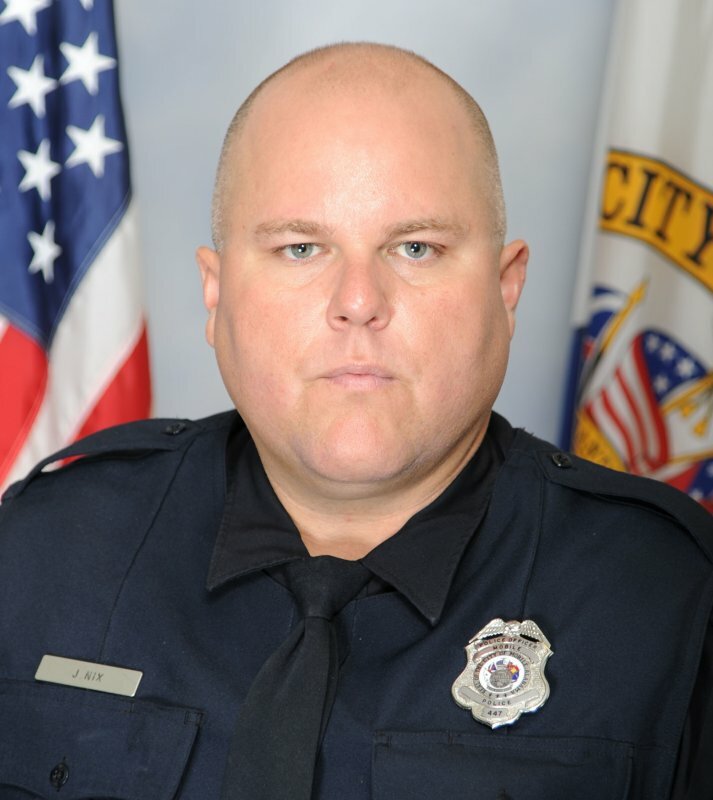 The Mobile Police Department has named Joshua Nix the Officer of the Month for December 2018. Joining the force in June 2011, Nix works patrol in the Second Precinct. With his keen attention to detail, Nix apprehended several suspects connected to vehicle and residential burglaries and thefts. On Dec. 5, 2018 at approximately 5:24 a.m., Nix responded to audible alarms at Twin Oaks Recycling, 6762 Old Pascagoula Road. Upon arrival, there were no alarms sounding in the area. However, with Nix having knowledge of the area he entered the secured gate and walked the property. He observed that dome lights were on in five 18-wheeler trucks. He then noticed one 18-wheeler truck stuck in the mud loaded with batteries. Inside the truck was also a woman. She was charged with five counts of unlawful breaking and entering a vehicle and theft of property first degree. Shortly before 1 p.m. on Dec. 17, 2018, Nix responded to a burglary in progress call at the 7400 block of Saybrook Blvd. He found the front window of the home broken and the victim hiding in the bathroom. There did not seem to be any entry made. Nix reviewed camera surveillance of the victim’s residence, which showed a man armed with a crowbar. With now a description, Nix quickly located the man who attempted to burglarize the home, finding him next door, and made the arrest. On the morning of Dec. 23, 2018, officers were dispatched to the 9300 block of Cottage Park Drive South for a report of another burglary in progress. According to the witness, a gray Nissan Altima was parked in the resident’s driveway occupied by three suspects. One suspect was seen kicking in the door of the house. As officers saturated the area, they located the vehicle. A traffic stop was initiated where the vehicle pulled into a driveway at the 4400 block of Dawes Road. The suspects got out and ran from the vehicle. A perimeter was set up. Nix observed a set of footprints from the vehicle and followed them. He was able to locate one of the suspects and took him into custody. There were a total of four suspects involved in the burglary. All four were located and charged with burglary third degree. For the month of December, Nix responded to 63 calls for service and 29 backings. He made 14 felony and five misdemeanor arrests, and wrote eight tickets. The Mobile Police Department will honor Nix at the Officer of the Month Luncheon, sponsored by the Midtown Optimist Club, on Wednesday, Jan. 9, 2019 at noon. The luncheon will be held at the Azalea City Golf Course Club, 1000 Gaillard Drive.